I sent a few photos off, but they said the lighting wasn’t good enough. So I brushed on some make up and hobbled out side with my son and said, “smile and look cute.” Four photos later, Grammy had snapped a great one I zipped off. Next I received an email from the fact-checker. All looked fine. The end of April I began my hunt for Parenting: The School Years magazine. A sub-magazine of Parenting, it was impossible to find, even at Barnes and Noble. I looked it up online and found the page. Yay! My quote made it. But uh, wait, no photo. Oh, bummer for Josh, my son! I finally accept that icky prednisone face just so maybe my son can get his photo in a national magazine and it doesn’t make the cut. But the quote . . . what did they do to that? It barely makes sense and sounds like I am just running around trying to prove myself capable of sliding down slides and “roller coasting” all over the place. Oh well. I’ve been an editor and I know the reasons why I used to have to cut things, clarify things, and people were not happy with me. But I would never have written, “but he must appreciate my effort.” I’m letting it go. Really, I am. Even if it does make me sound a little ditzy. That’s the risk you take when you give editors your articles or quotations. But just for the record, I am a good mom NOT because I can do these things (I can’t do them now, like I could 5 years ago!) but because my son inspires me to be the best I can be–limitations and all. And for the record, I told my son, “Mommy loves you as big as the ocean!” and his reply was, “I love you as. . . big as the toilet.” It helps to hear that in context. I mean. . . I don’t want anyone thinking I encourage potty talk. Now. . . I have to go tell him our photo didn’t make the cut. Somewhere in there is a life lesson, but I am too tired to find it right now. 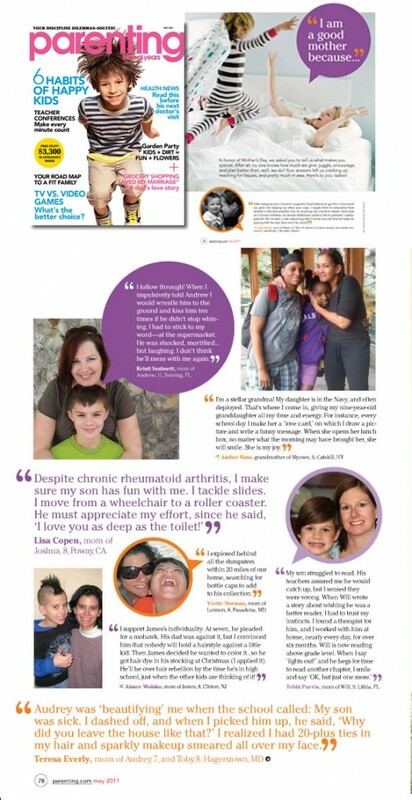 Lisa, I am happy to see disable mothers represented in the article on what makes a good mom. Even if your quote was skewed compared to your original, the point was made – we can be good moms even when limited Your son’s comment was so funny and adorable! Thanks for all your hard work and outreach. .